We request you to support 9 year old Dhanraj Aghav. This child has undergone an Open Heart Surgery in Feb 2016. He is very enthusiastic boy studying in 5 th std. He wants to study hard and earn a good position in the society. Dhanraj’s father is a farmer and undergoing financial crises due to drought in Parbani dist. He is unable to pay Dhanraj’s school fees due to current scenario of drought. 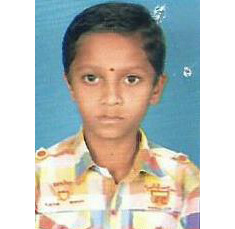 Child Help Foundation depends on the generosity of individuals to offer help to Dhanraj and educate this farmers child and help them out of this situation.